Whether you call it sweat or the more proper, “perspiration,” it appears getting a bit clammy while working out protects against exercise-induced asthma attacks. A new study by scientists at the Naval Medical Center in San Diego evaluated 56 otherwise healthy Marines who were challenged with such symptoms as wheezing, coughing or breathlessness during high-exertion spurts of physical activity. Those Marines who sweated more suffered fewer systems. That’s the kind of opposites attraction you are looking for in life. The study was published in this month’s issue of the medical journal Chest. The researchers suggested that the “same mechanisms” that generate a person’s sweat volume also dictates the amount of water secreted by the lungs’ airways. In contrast, the Marines who perspired less also experienced more problems and, likely, drier airways. A lack of moisture in the airways tends to constrict the passages and lead to breathing disruption during the workout. Not surprisingly, sweating more during exercise also leads to greater saliva and teardrop production. As we all learned in school—gee, wasn’t health class fun?—sweating is a natural process and some of us perspire more than others. Like Michael Jordan, one of the coolest human beings in history, who would stand dripping at the free throw line during Chicago Bulls games. But the researchers were clear: Don’t purposefully overheat yourself during exercise (no rubber suits allowed); that can be dangerous. While the 56 Marines in the study (whose bodies were voluntarily manipulated with medications to induce airway narrowing and heavier-than-normal sweating) are no doubt elite athletes, Dr. Warren Lockette, lead author of the study, has a first-hand look at how exercise-induced asthma can affect Olympians. He is medical adviser to the University of Michigan’s women’s swimming team (and, yes, he bumped into mega-gold medalist Michael Phelps regularly in Ann Arbor). In his work as chief researcher at the Naval Medical Center and formerly as a medical officer with the Navy SEALS, Lockette was keenly aware that some young recruits were blocked from becoming divers or special warfare operations participants because of exercise-induced asthma. It motivated him to look deeper at the problem, which is especially vexing for how it fells such highly conditioned individuals. The study results confirmed some measures that Lockette already suggested for University of Michigan swimmers and others who train in Ann Arbor and with the Olympic program. “We found that by controlling air quality during workouts, as well as by providing individualized attention to our athletes’ hydration and nutrition, we could reduce the limitations imposed by hyperreactive airways in many individuals,” said Lockette. “It now appears that how much fluid your airways secrete could be a key determinant in protecting you from exercise-induced asthma,” he said. “So, if athletes sweat, drool, or cry, at least they won’t gasp. 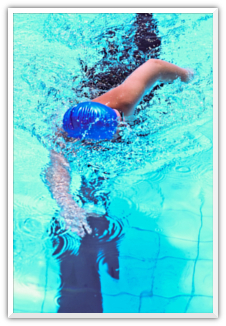 If you are wondering, yes, you can sweat profusely during a fitness swim. It might not seem like it, but laps in the pool can be a superior cardiovascular workout. Phelps, for instance, regularly exhorted Michigan football and basketball players about the quality of swimming workouts. Braylon Edwards, a star wide receiver for pro football’s Cleveland Browns and former Michigan standout, was persuaded enough to make swimming part of his off-season conditioning. He ran track drills in the water one day and swam the next. That water-workout thing turned out sort of OK for Phelps. Let’s see if Edwards gets along as swimmingly is his chosen sport this fall. Click Here For More Great Asthma Treatments! So, is there a way to increase the likelihood of perspiring during a workout? Will drinking more water help? I suffer from this problem during strenuous exercise, and it’s even worse during outdoor runs on cold days.